Mankon Museum is in Bamenda, Cameroon. As the name suggests, the museum displays the history of the Mankon ancestors. This is done through various exhibits including artefacts and boards telling the stories of the past ages. Evolution of different objects can be observed here. Do make sure that the museum is open before going, as it is closed sometimes. 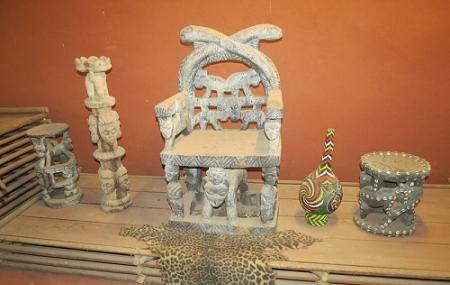 Use Bamenda trip planner to visit Mankon Museum and many others to your visit. Add comfortable hotels to your plan, choose from the recommended hotels in Bamenda like Apple Gate Hotel, Zwinkels Guest House Bamenda, Admiralty Serviced Apartments and Shatuma Guest House. Find out how to reach Bamenda to begin with. Plenty of wholesome Bamenda vacation packages are available to choose from, pick your today! Love this? Explore the entire list of places to visit in Bamenda before you plan your trip. Fancy a good night's sleep after a tiring day? Check out where to stay in Bamenda and book an accommodation of your choice. Nice insight to the living history of the Mankon Fondom.